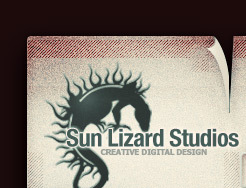 Sun Lizard Studios is an innovative digital design studio located in Bergen County. We provide graphic design, web design and software instruction from our office in Bergenfield, New Jersey. We specialize in developing business solutions from corporate branding to web design and printing. By joining exceptional design with cutting edge technology, Sun Lizard Studios provides a unique, satisfying and creative design experience for all of our clients. First and foremost, Thank You!. Words cannot adequately express the depth of my gratitude for your efforts in helping me get my brochures, waivers and business cards printed. I truly appreciate your efforts and assistance. Sun Lizard is designing the newest CD cover and packaging for local Jersey shore musician Anthony Rufo’s upcoming CD release. Copyright (c) 2006 sunlizardstudios.com. All rights reserved.